Recruiting students has become more competitive than ever, as students are faced with numerous options. As a result, marketing budgets have increased 50% over the past seven years, according to a recent Primary Research Group study. Additional findings indicated that spending on interactive and web marketing directly correlates with recruiting more qualified student applicants. How do you make sure you are spending your money wisely on recruitment marketing? Find a product that is relevant and useful for students that will help drive them to your website. With 82% of high school students downloading music, according to a recent Piper Jaffray study, music download cards are an enticing and affordable item. 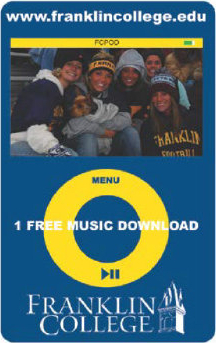 Throughout the country at both small colleges and large universities, music download and ringtone cards have become popular and effective promotional items for prospective students. A recruitment or admissions employee can easily hand out cards at events to help drive traffic to a website and collect additional student information. Music download cards are given away to prospective students at recruiting events, college fairs, campus visits, or sent via direct mail. Students go to the URL listed on the card (typically a campus website) and click on the Music Download link. Students complete the data form with mandatory information. Colleges have the option of customizing data fields and making each field either optional or mandatory. This valuable data can be used as part of the ongoing communication that occurs during the recruitment and admissions process. Students can now choose from over 3.5 million songs. This provides real-time results on the effectiveness of any Music Download Card Promotion. To learn more, check out our Music Download Card products.